There were a total of 120 M&A and ECM transactions announced in Yorkshire & Humber during Q1 2016, the same number recorded for the corresponding period the previous year. However, year-on-year deal values fell by 69% from £1.8bn announced during Q1 2015 to £552m confirmed so far in Q1 2016. Yorkshire & Humber contributed to 6.9% of the total number of transactions recorded in the UK and 1.5% to the total value of UK deals. 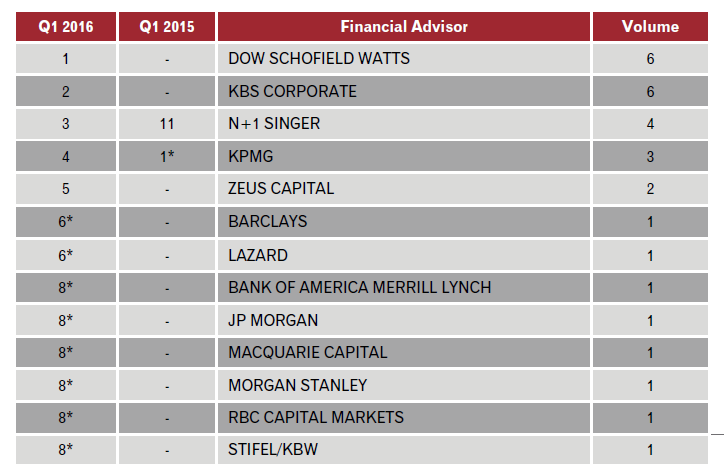 Dow Schofield Watts was the most active financial advisor in Q1 2016, participating on six deals. Barclays and Lazard shared first place on the Value Table advising on the same transaction valued at £154m, this being the US-based acquisition by IDEX Corp of Akron Brass Co, from Leeds based Premier Farnell Plc, for a cash consideration of £154m. This transaction was a significant factor in Skadden Arps Slate Meagher & Flom finishing top of the legal advisor value rankings having provided legal support to IDEX on the deal. 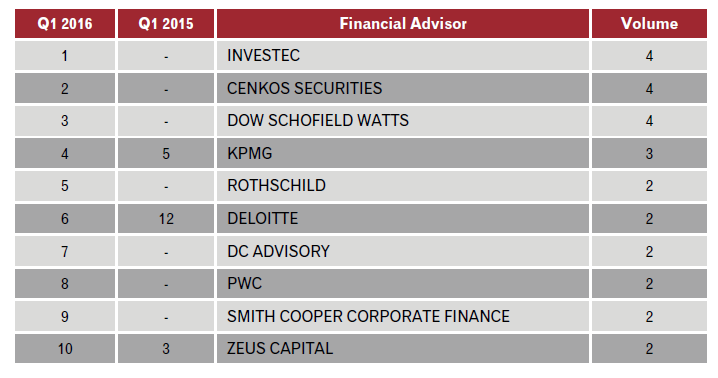 The highest legal advisor by volume was Walker Morris, advising on five transactions. Experian recorded 167 deals in the North West in the first quarter of 2016, which didn’t quite match the total of 171 announced during the same period in 2015. Deal values also fell, from a total of £2.7bn in Q1 2015 to £2.3bn in 2016, representing a 15% decline. The only deal value segment which saw more movement than Q1 2015 was the large deal bracket in which values more than tripled from £448.6m to £1.6bn, whereas all other segments saw moderate decreases in overall value. Of the five large deals, by far the biggest deal announced in the North West during Q1 was Apax Partners’ partial exit from Auto Trader for £852.8m which equates to a return of 4.8 times its investment since the initial acquisition of a stake from Guardian Media Group in 2007. Another notable deal involved Greencoat UK Wind Plc, together with a joint venture company partly owned by the Greater Manchester Pension Fund, acquiring a 49.9% stake in the operator of a Scottish wind farm from electricity distributor SSE Plc for £355m. Simpson Thacher & Bartlett, which acted for Apax Partners on the Auto Trader deal, headed the legal advisor value rankings ahead of CMS (£356m). Addleshaw Goddard, which provided advice on deals worth £235m, ended Q1 as the most active legal advisor in the region with nine deals, followed by Shoosmiths on eight. North West-based Brabners, acting on deals worth £41m, were third most active. Bank of America Merrill Lynch and Deutsche Bank, joint bookrunners on the Auto Trader deal, topped the financial advisor value rankings while Rothschild’s work on transactions worth a total of £540m put it in third place. Investec, Cenkos Securities and Dow Schofield Watts all ended the quarter on four deals.